In Sardinia, tuna is a highly seasonal product that's greatly appreciated and skilfully preserved for the winter. Care is taken to use almost every part of the fish and waste nothing. This is particularly true in Carloforte, the coastal town on the Isola di San Pietro, just to the south west of the main island of Sardinia, which is famed for its tuna recipes. Tuna is often eaten with couscous here, reflecting this little island's diverse and interesting history. The tuna in our Carlofortino sauce is prepared to capture all the flavour of a freshly made sauce. The basis of the 100% organic sauce is tomato, along with organic onions and garlic; but then it takes an unexpected turn with organic pesto that includes pine nuts and grated cheese. Part pesto, part sauce, our authentic Carlofortino is totally natural and preservative free. 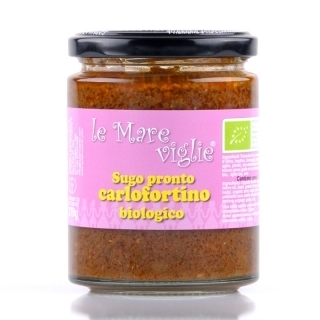 Delicious with our penne di semola, it makes a tasty, filling meal. It's great with rice, too. Ingredients: organic tomato, organic pesto (olive oil, basil, grated cheese (milk), garlic, pine nuts), organic extra virgin olive oil, yellowfin tuna (fish), bluefin tuna (fish), organic onions, organic garlic, salt.